Okay, anybody near this? Sure doesn't sound kosher. since the mid-1980s. It was found on her parents' farm near Tipton. JEFFERSON CITY, Mo. 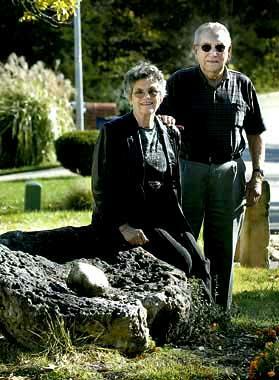 --The black, pitted rock at the corner of Dorothy Lemke's property draws many curious passers-by. Recently, a schoolteacher stopped to visit with her about it. The visitor was not so surprised to learn it was a meteorite unearthed in a Versailles-area prairie turned terraced farmland more than 50 years ago. "I don't think many realize the significance of it," Lemke said. She has extended the invitation for students from the school across the street to come visit. But, "I think they can't visualize what I have," she said. When Lemke's father encountered the 4-foot-by-4-foot-by-2-foot mass of iron in 1950, he was expanding his environmentally friendly farm. And Lemke was a teenage girl more interested in boys. But as she became more aware and interested in archaeology, she realized the large rock, which they thought was an Indian stone, held sentimental value for her and she moved it to her home, then in California. It's taken heavy machinery to move the outerspace rock - three times now. And it continues to sink back into the ground the longer its sits. "It was just a big rock from the farm I grew up on, that I detested then but is precious to me now," Lemke said. About four years ago, Lemke had a geologist analyze what she had. "I was told there may be precious jewels inside," Lemke recalled. That was not the case, but she learned it was more than 300 million years old. And the oldest part is the sandstone that must have been struck by a stream of hot iron in space that filled in its cracks, the expert told her. "There's a lot of rocks in this town and many have them in their yards," Lemke said. "But not many are full of iron and 300 million years old." Lemke treasures her unique landscape feature; it didn't need to have diamonds inside, she said. If people might want to dispute the fact that this is a meteorite, Lemke admitted she wasn't an expert. However, "it couldn't be transported by humans and it had been buried for many years with no (similar) ones around it," Lemke defended. But she doesn't need to convince anyone, she said. She's content to see the sparkles of sandstone against the black iron when she works in her yard. And it's a reminder of the hard work her father put in to make their farm-home thrive. "It was just farmland then all of a sudden there was this rock that was buried," Lemke said. "Anytime we run out of places to explore, surely we'll findsomething, if we explore the land."